Celtic Radio: Scottish, Irish & Celtic Music - Free Radio! Help Support CelticRadio.net! Become a Founder member today! How do you listen to our music? 1. Live365 website or app. 2. Web Play or stream from Celtic Radio. 3. Third Party App or website. Come join the Motley fools discussion! Jester's court is now in session! Please support us by visiting our sponsors! One of the goals of Celtic Radio is to bring together a community of listeners and musicians that share a unique bond of culture and music. Our community events section contains an event calendar, chat rooms, member birthdays and more! All members and musicians are encouraged to post their local events to the calendar. Special chat rooms are available upon request. Watch this section for special community events! Gaelic Proverbs come primarily from the western Highlands and Islands of Scotland, and they have a distinctly rural or agricultural flavor which reflects the society from which they were gathered. It is to be expected that many of them pertain to the weather, to the planting of crops, and to country life in general. Others reflect the Gaelic love of company and hospitality, fear of poverty and laziness. Ma tha Dia ann, s chan eil fhios a bheil, fag eadar sinn fhein s na biodagan! If there be a God, and no one knows whether there be, leave it between ourselves and the dirks! Few countries have a greater number of proverbs than has Scotland. Even today, everyday speech in Scotland is sprinkled with them. Scots are wonderfully given to this way of speaking, and the lovely Scots tongue loses much of its flavor when forced to translate their unqiue language. Those that appear in English have been preserved that way for at least 200 years! Poets and painters are aye poor. St. Patricks Day is many things to many people. For some it is a chance to celebrate their Irish heritage and remember their ancestors. For others it is a great day to plan a party and get together with both Irish and non-Irish friends. And of course many of us simply see St. Patricks Day as an excuse to drink lots and lots of green beer. No matter how you choose to celebrate St. Patricks Day, the history of this holiday is certainly worth examining. 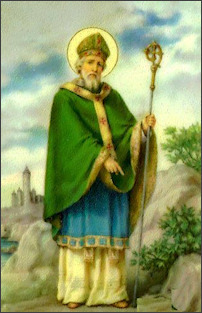 The original St. Patrick accomplished much more than ridding Ireland of snakes, and he emerged from his pagan roots to become one of Christianitys best known figures. Read more from Celtic Radio...then check out the video below! Burhan Öçal performs with Eileen Ivers & Immigrant Soul  one of the great innovators and pioneers in the Celtic and World Music genres. The collaboration of African and Latin percussion and bass, Irish instruments, and American soulful vocals with Turkish instruments will be unlike any show you have seen or heard before. Soccer - Play a world cup soccer tournament game. Choose your team from different countries. 3D top down view! Today is a special day for these CelticRadio.net members. We have 120 members that are celebrating their birthday today. Wish them a happy birthday by clicking on their member name to send a birthday greeting with our private messaging system! octospidr(58), Cragganmore(55), Crusader(33), Celticwolf(46), Crestfallen(46), beanie414(78), peckery(59), pennys(63), halfscot(64), 0Boyle(42), singercait(66), EvWill(50), celticbarry(70), minhamadabruxa(46), firepipes24(55), larrybeemer(72), knight_76022(47), vicarial_silver(35), djohnson(66), dsparling(59), edwinwkelley(68), Auradine(66), bonnieblue504(72), energyh(43), stc911(73), Gijah(63), nekidtater(39), Sorscha(31), jwelc53(66), LORD3(43), Highlandpixie(40), alexandraparasca(37), Ericthered(68), nlw23722000(47), celtic force(62), fastlane128(32), grizzly2352(67), tom4878(71), barbara(82), rks1138(55), wdkmg(60), ihittman(52), Cathy(61), carlyqueu(53), Pandora(55), MattKalvin(34), celticlaura(67), CinnamonRidge(58), Tom McLellan(63), miki015mira(44), kingbriguy(63), tanner(43), Triciab729(48), Teresa23(39), aprilcolleen(59), Lowder77(42), anncurtis(62), quiethps(50), cassandraxveroicaxonealaxlawson(29), kathleenkane(65), drgntkd(49), rebolz(71), pyjama888(45), artt(44), Akuma(28), dilcrawf(62), MacKimm(65), ragnar81(50), shorusgordon(67), stefjoe(70), caityburrdy(66), cobrien(60), Haytham(34), scooterchik(41), lkanary(64), craziwolf(34), AprilBettiePage(54), newfie71(44), raghuv9246(37), terrykoontz(39), celticwolf210(46), curlyblonde70(49), summergirl(63), beschmid(65), celticlightning(68), haley1897(48), stormygt(32), CrikWoman(48), shay(51), jamminjamielynn(42), TheWhiteElk(30), JMMonbleau(49), yof8ful(52), Tamantha(49), pinkguitar23615(38), Bratgirl54(65), DeeSpec(67), doonhamer(61), unicorn42359(60), eamiller6(39), SolanaGothard(24), tonyagreen(53), oehlke(47), SullivanMorro(46), tom108(63), Downsman(73), LaurenceEdge(64), Lianag(71), Caityburrrdy(66), AnnieofTain(61), GayleDavidson(63), words(77), Naundorf(75), TheScottishandIrishStore(16), katieogrady(66), kpassala(43), EmmaGrace(57), hasifa22(26), CelticDJ(66), tkell(63). Read more about your Celtic Zodiac sign! Share a laugh and drink with the regulars. Leave your worries at the door!